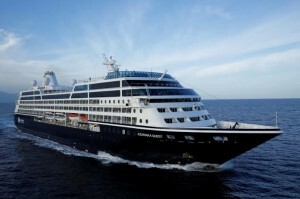 Award winning Azamara Club Cruises, which is owned by the same company as the world’s largest cruise line, Royal Caribbean International, is a luxury cruising brand that offers itineraries featuring longer and more overnight stays in port so that guests can truly experience each destination to its fullest. A 17-night Great Barrier Reef & Bali sailing departing Sydney 13 February 2016. Azamara Quest will make 25 port visits in Australia and New Zealand over her two months based here including Port Douglas, Townsville, a number of islands on the Great Barrier Reef, Melbourne and Hobart as well as the Bay of Islands, Auckland, Dunedin, and Milford Sound in New Zealand to name a few. Gavin Smith, Regional Vice President, Asia Pacific for RCL Cruises Ltd, says the arrival of Azamara Club Cruises in Australia and New Zealand is a response to a ‘buoyant’ cruise tourism market and huge interest from Australian guests. Last year the cruise line introduced AzAmazing Evenings, a complimentary night tour on each voyage that provides guests with an exclusive and bespoke slice of a destination’s authentic culture and character. Details of the 2016 AzAmazing Evening events are yet to be announced however previous events have included samba shows in Rio de Janeiro, exclusive Three Tenors performances in Italy and dining experiences like the French aristocracy at the Chateau Giscours in Bordeaux, France. The boutique Azamara Quest is a mid-sized ship which offers its 694 guests exceptional service and fine cuisine from around the world. The line also offers more included onboard amenities such as English trained butlers, specialty coffees and teas, boutique wines, international beers and select standard spirits. Fares for Azamara’s inaugural Australian season start from AU$6,069* per person for a 16-night Australia & New Zealand explorers sailing departing Sydney 16 January 2016. For Australians wishing to get an earlier taste of Azamara’s specialty cruising experience, the luxury line is offering a double stateroom upgrade special on selected global sailings to guests who book a cruise for 2014-15 before May 31, 2014. Now open for sale, the 2016 programme is an expansive, curated collection of culture-rich metropolises, charming colonial towns, stunning beaches and unsurpassed natural preserves in some of the world’s most intriguing destinations including South America, the West Indies, Europe, the Far East and Australia. The full programme includes 52 voyages, ranging from five- to 18-nights. Catering to up-market travellers, Azamara Journey and Azamara Quest will visit a total of 204 ports in 70 countries, calling at destinations that have been made famous by myths and legends, history and beauty. Australian travellers can combine consecutive itineraries for an Azamara Extended Voyage that spans multiple regions and an expansive array of destinations. For example, travellers can embark on the 12 December 2015 voyage from Singapore to Auckland on a 50 night one-of-a-kind odyssey visiting a host of Indonesian, Australian and New Zealand ports and cities as well as multiple small ports and towns that are not accessible to larger ships. Or travellers can embark on the 31 January 2016 sailing in Auckland, on a 107 night itinerary to Athens, via New Zealand, Australia, the Far East to the Arabian Gulf and the Mediterranean. To make a booking or for further information visit www.azamaraclubcruises.com, phone 1800 754 500 or contact your local travel agent. Travel professionals can call 1300 754 500 or visit: cruisingpower.com.